The cruise control system provides automatic speed control for your comfort when driving on straight, open freeways, toll roads, or other noncongested highways. This system is designed to function above approximately 25 mph (40 km/h). NOTE: Cruise control is not recommended for city driving, winding roads, slippery roads, heavy rain, or other bad weather conditions. 1. Push in the cruise control main switch on the end of the barrel. The "CRUISE" indicator light in the instrument cluster will be illuminated. This turns the system on. 2. Accelerate to the desired cruising speed above 25 mph (40 km/h). 3. 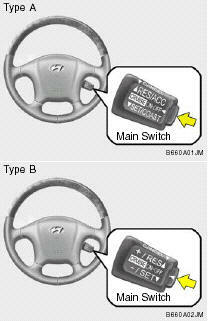 Push the cruise control switch downward to "SET/COAST" or "-/SET" and release it. If the "SET/COAST" or "-/SET" switch is selected the "CRUISE" and "SET/COAST" or "-/SET" indicator light in the instrument cluster will be illuminated simultaneously. 4. Remove your foot from the accelerator pedal and the desired speed will automatically be maintained. 5. To momently increase speed, depress the accelerator pedal enough for the vehicle to exceed the preset speed. When you remove your foot from the accelerator pedal, the vehicle will return to the speed you have set. WARNING: To avoid accidental cruise control engagement, keep the cruise control main switch off when not using the cruise control. o Depress the brake pedal. o Depress the clutch pedal (Manual transaxle). o Shift the selector lever to "P" or "N" position (Automatic transaxle). o Decrease the vehicle speed to less than 25 mph (40 km/h). o Release the main switch. The vehicle will automatically resume the speed set prior to cancellation when you push the control switch upward to the "RES/ACC" or "+/ RES" position and release it, providing the vehicle speed is above 25 mph (40 km/h). 1. Push the control switch upward to the "RES/ ACC" or "+/RES" position and hold it. 2. Accelerate to desired speed and release the control switch. 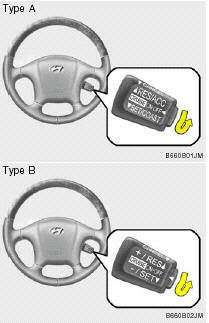 While the control switch is held, the vehicle will gradually gain speed. 1. Push the control switch downward to "SET /COAST" or "-/SET"and hold it. The vehicle will decelerate. 2. When the desired speed is obtained, release the control switch. While the control switch is pushed, the vehicle speed will gradually decrease. WARNING: o Keep the cruise control main switch off when not using the cruise control to avoid inadvertently setting a speed. o Use the cruise control system only when traveling on open highways in good weather. o Do not use the cruise control when it may not be safe to keep the car at a constant speed, for instance, driving in heavy or varying traffic, or on slippery (rainy, icy or snow-covered) or winding roads or over 6% up-hill or down-hill roads. o Pay particular attention to the driving conditions whenever using the cruise control system. o During cruise-control driving with a manual transaxle vehicle, do not shift into neutral without depressing the clutch pedal, or the engine will be overrevved. If this happens, depress the clutch pedal or release the main switch. o With the cruise control engaged, when the brake pedal is applied, it is normal to hear the cruise control system deactivate. This is an indication of normal system operation. o During normal cruise control operation, when the "SET(COAST)" is activated or reactivated after applying the brakes, the cruise control will energize after approximately 3 seconds. This delay is normal.